Sherborn Pastor: After the Marathon: We are OK. We are not OK. We will be OK.
After the Marathon: We are OK. We are not OK. We will be OK.
That’s all I wanted to hear from loved ones and neighbors and friends yesterday afternoon and evening, in the minutes and hours after two explosions ripped through the finish line area of the Boston Marathon. 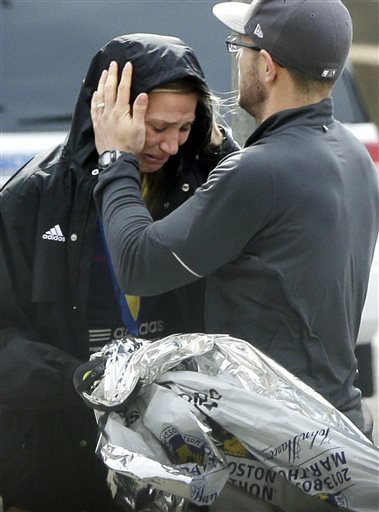 With hundreds of thousands of folks jammed into downtown Boston for the Marathon and the Sox game, a collective fear hovered like a dreadful spirit over the Bay State: that someone we knew was hurt or killed. As frantic updates about the blasts spread like wildfire across Twitter and jumbled news reports spun around the web and TV and radio, so many of us waited to hear just something. To hear anything. To get a text message, or read a Facebook status update from a runner or spectator we worried about. We feared the worst. We needed to know, to find out what happened to them. Even those of us miles away from Boston, we heard from our circle of loved ones too. From all across the country, even the world, they texted, emailed, and called us. “Is everyone alright? What happened! ?” Those of us on the periphery of this tragedy: we let our folks know that we were okay too, that we are okay…right? Well…no, not really. We are not okay. Not yet. Maybe not for a long time. Maybe not ever. This is true too. Not okay if we lost to death a loved one in what was an intentional and cruel act of violence against the innocent. Not okay if we’re one of the scores of injured who one moment cheered on the runners and the next moment laid on the ground surrounded by carnage and chaos. Not okay if we are one of the cops or doctors or nurses or firefighters or Good Samaritan bystanders who courageously ran towards and into the blast to help, to comfort, and to rescue. I can’t imagine what they saw, how they did what they did. Can you? We are not okay if we felt and heard the echo of 9/11 rippling across our region with a sickening familiarity, bringing back memories of a day that had mostly softened and faded in our hearts. We are not okay, for it is not okay, that another world city, our city, now takes its place among the ranks of those locales shattered by bomb blasts and terror. New York. London. Madrid. Mumbai. Boston. So thank God we are okay. And oh my God: we are not okay. We must name this spiritual contradiction right now, this tension and churning within our broken hearts. How all our feelings are mixed up and mashed up: sadness and relief, grief and guilt, shock and anger, the question of “Why?” with no immediate answer. We want to hurry up and put it all back together again: normalcy, a warm Patriots Day like so many others before, Boston as our special city, safe, and tucked away in sweet familiar April memories and marathons and everything which makes this place shine. God knows we’d like to go back in time but we can’t. So…we are okay. We are not okay. We will be okay. But not yet. I greatly appreciate your thoughts on how we feel all three of these things at the same time. John, I heard you preach many many years ago during a visit to- was it Rhode Island? I cannot remember, except that it was somewhere south of here. But I do remember being moved by your preaching that day. Then I came home, and did not hear of you or know anything at all about you, until I read this today on a friend's facebook wall, and discovered you are now my neighbor. (I am in Natick and attend FCC Natick with Vicky Guest and Summer Shaud). Once again, I am moved. Thank you for finding words that so accurately portray what it feels like to be a resident of greater Boston today. Thank you Deede. I wrote it as much to understand for myself as to speak to others. FCC is a good church and Vicky is an excellent pastor. If you are ever in Sherborn come by and say hi. Thank you. This is eloquent and perfect and I needed to hear this, even though I'm on the west coast and didn't know anyone running yesterday. I'm okay. I'm not okay. I will be okay. Thank you. Thank you for your words. Prayers your way for continued healing. John, you've already gotten so many shares off my facebook page; this is definitely balm for wounded souls. I sent it to both my kids away at college, when I am at a loss for words, you seem to find just the right ones. Thanks Amy--strange days...we need to have coffee soon! We have never met. But your reflection spoke directly to my heart and my condition. For an hour or so I did not know where my daughter and her young child were. Finally I learned that they were o.k. - having left the finish line area at 1 pm or so. Then, the pain of all the rest flooded in. How could this evil happen again? Here? Maybe it will be o.k. again. Until then, we wait. Thank you for your wise words. Thank you Louise..lots of questions and not a lot of answers, not yet. Keeping you and your loved ones in prayer. The College Said "NO" But God Always Says "YES!"